Consumers who buy professional hair care products at major retailers -- or at grocery and drug stores -- are not getting the bargains they may think. "The consumer is getting ripped off because not only are they paying more for the products, those products did not come from us, they are not guaranteed, and they could be old, stolen, counterfeit or tampered with," says Vikki Bresnahan, director of product distribution control for Paul Mitchell. "It's definitely a buyer-beware situation." 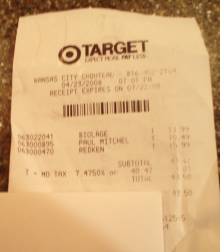 To illustrate how this scheme affects consumers' pocketbooks, ConsumerAffairs.com purchased three professional hair care products from a Target store in Kansas City, Missouri. We didn't have any trouble finding these types of products in the store. The shelves on one side of an aisle were filled with various brands of salon-exclusive shampoos, hair sprays, conditioners, and other products.  An 8.5-ounce bottle of Paul Mitchell light-hold finishing spray for $10.49. We discovered these same products would have cost much less at a professional salon. "Our retail price for that finishing spray is $7.50," says Paul Mitchell's Bresnahan. "You just paid $2.99 more than retail for a product that is diverted. "When consumers go into Target they think they're getting a product that is cheaper," she adds. "But they're not. And not only are the products not cheaper, they may not be the real thing." We contacted professional stylists at The Sharper Cut in Kansas City to compare the prices on the other salon-exclusive products we purchased at Target. Once again, we discovered we paid more than professional salon prices.  The Redken Guts 10 volume spray foam retails for $14.99. We paid $15.99 - or $1 more -- at Target. We also learned the hair care products we purchased at Target had tell-tale signs of diverted merchandise. The tall, silver can of Redken Guts 10 volume spray, for example, was dented and dirty. 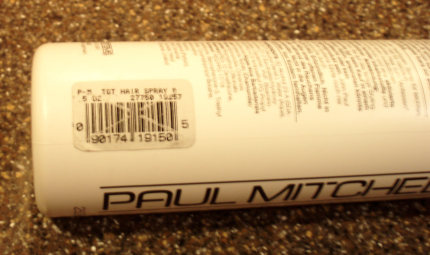 Part of the batch code on the Paul Mitchell finishing spray was missing. Some of the lettering on the bottle had faded, too. And all the bottles had stickers attached to the containers ones that looked like someone had taken a razor blade and cut an "X" through them. "At Paul Mitchell, we don't have stickers on our bottles," says Bresnahan. "Our UPC codes are printed on the plastic. That sticker you see is probably on top of our UPC code and is the code that Target or the wholesaler who bought the product use to scan the merchandise." Missing batch codes are common signs of diverted products. "We've had cases where the batch codes are totally or partially removed," Bresnahan say. "That can be dangerous if we have a recall. We don't contact Target because they're not an authorized dealer. And if a consumer hears about the recall -- and the batch code is removed -- they can't tell if the product is included in the recall." Dirty or dented bottles are additional warning signs that products are diverted, Bresnahan says. "That's typical. It's also typical to see dusty or sticky products. I wouldn't buy them. And if a can is dented, how do you know that the pin used to spray the product is not broken? "It's also possible that these products could be outdated," Bresnahan adds. "I have seen with my own eyes where older packaging is on the shelves." But how do these professional hair care products -- which usually state on the bottles that they are only to be sold in salons -- wind up on the shelves at Target and other retailers nationwide? Isn't it illegal for Target and retailers to sell, for example, the Paul Mitchell finishing spray that clearly states on the bottle: "Guaranteed only when sold by a professional hairdresser, otherwise it may be counterfeit, old, or tampered with?" "We'd like Target not to carry our brands and we've voiced that concern to them," Bresnahan says. "We've written letters to them saying the source of their products is suspect and they can't guarantee they are buying quality products. "But it's not illegal. We tried to get legislation passed a few years ago (to make diversion illegal) but we were not successful. So, what Target and other retailers are doing is not illegal." The illegality, she says, comes into play when someone in the company's distribution chain breaches a contract. For example, a professional salon selling products to unauthorized dealers or distributors. "When we catch salons selling our products out the back door, we take immediate action," Bresnahan says. "We immediately cease doing business with them and if we can take legal action against them, we do. "We also have the ability to track products back to the distributor who sold them and when that distributor is identified, there is a penalty." It's also illegal, Bresnahan says, for anyone to steal or tamper with the company's products -- or make counterfeit merchandise. "We had a counterfeiting case and discovered the products contained high levels of bacteria," she says. "In that case, we worked with customs and Food and Drug Administration (FDA) officials."  A diverter approaches a salon owner or manager. The diverter offers to pay the salon 10-30 percent over cost. "A lot of time, the salon might need some extra money -- or the manager might not know he or she is doing anything wrong -- and they agree to do business with the diverter," Bresnahan says.  The salon orders the products. The diverter returns to the shop, pays the agreed price -- often as cash under the table -- and picks up the unopened boxes. "They do this until they have truckload and then they take the products back to their warehouse," Bresnahan says.  Once in the warehouse, the diverters remove the batch codes on the products. The decoded products are then shipped to discount stores, grocery stores, and drugs stores nationwide. "This happens every day," Bresnahan says. "What you saw in your Target is likely what is in most Target stores across country. It's an industrywide problem." Matrix and Redken echo Bresnahan's concerns. "The average price for a bottle of Matrix shampoo or conditioner is generally 10 percent higher than salon retail prices," the company's Web site states. "Matrix products are available exclusively in salons because only trained and licensed professional stylists can prescribe the best products for use in the salon or at home." Redken doesn't mince any words in its warning to consumers about diverted hair care products. "Diverted products can be counterfeit, diluted formulas, or old, expired formulas that may not be safe to use," the company's Web site states. "Contaminated or counterfeit products could cause irritation or even infection." ConsumerAffairs.com contacted Target about the sale of diverted hair care products. The company told us it doesn't see anything wrong with selling these salon-exclusive products in its stores. "Target has chosen to offer professional hair care products to better serve our guests," the company wrote in a statement issued to ConsumerAffairs.com. "We have purchased these products on the open market and are conducting our business in full compliance with the law. We believe our guests appreciate having these high-quality products available in our stores." We asked the company how these diverted products could be considered "high-quality." Target's spokesman, Joshua Thomas, said he couldn't provide any additional information regarding that question beyond what he said in the company's written response. When asked about the price differences, Thomas said: "We always strive to be competitive in the area." Consumers, he added, can return these hair care products to Target within 90 days of purchase -- and if they have their receipt -- receive a refund. Bresnahan, however, warns consumers not to waste their money on any professional hair care products sold at retailers nationwide or at local flea markets that are popular during the spring and summer months. "Salons can't decide to set up booths at a flea market in their community. We don't allow our products to be sold at flea markets." She adds: "My message to consumers is this. If you want to be guaranteed that you're purchasing a real Paul Mitchell product, purchase one at a salon from a professional hairdresser. It matters to us where you purchase our products. We want to guarantee you're getting real products. If you buy them someplace else, there's no guarantee what you're getting." 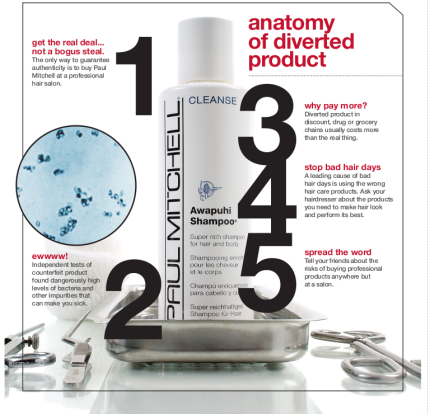 Consumers who suspect they've purchased a diverted Paul Mitchell, Matrix, or Redken product should contact the company.  Redken's security department, or via phone at (800) 503-3997.